When you refer a customer you will earn 10% commission - regardless of the product. That's right, if you refer a customer for web hosting, you will get 10% commission each month. It gets even better if you refer a customer for web design. Your 10% commission will be paid upon completion and payment of the customer. For a $10,000 website, you get $1,000! Sign up today, and start earning your comissions. 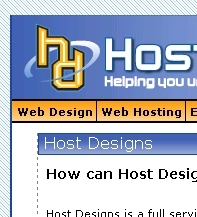 Host Designs is a full service solution to all of your web needs. We offer web design, site maintenance and web hosting services, in addition to free domain registrations and reservations, free site statistics, and even search engine registrations.